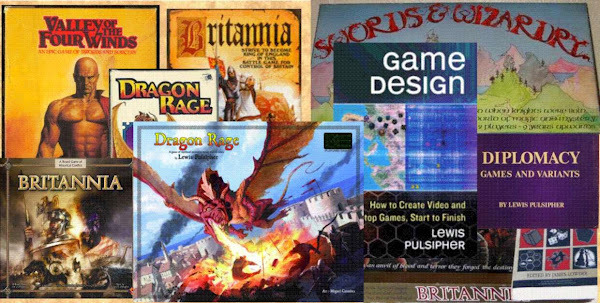 Those who were interested in my discussion of connections between online games and boardgames might want to look at War of the Realm, a free online "boardgame". Or click the title of this article. I haven't figured out how they're going to make money, yet. Advertising, I'd guess. ADDITION: I've now read the rules for the game. While I have only read the rules for A Game of Thrones: the Boardgame (FantasyFlight), War of the Realm reminds me *very* much of that game. This is perfectly legal, mind you (you cannot copyright ideas), it's just an observation. And the most remarkable part of that is that AGoT:tB was designed specifically to mimic simultaneous movement as much as possible without requiring anyone to write down anything. (I've heard someone call AGoT:tB a Diplomacy variant, though I'm not sure I'd go that far.) Yet for online computer-refereed play, simultaneous movement is no problem at all. But in going through the many phases of the boardgame online player by player, you slow everyone down! Why not devise a game with simultaneous movement? Perhaps the company expects to retail the game as a boardgame at some point. I also see that the company offers memberships, about $5 or $7 a month, that provide various perks (such as being able to play more than 4 "casual" games (play once a day rather than play real-time) and no ads). These memberships emphasize the community. It would be really interesting to know how many people (what percentage of player) will go for these memberships. PrezCon in Charlottesville, VA late in Feburary appeared to be somewhat smaller this year. Two people who might know said 20%, but I don't know if that was from pre-registrations; the organizer himself said he didn't know the attendance. Attendance last year approached 500. This obviously is an effect of the poor economy. I was told the prices at the auctions were lower this year, as well. PrezCon is a mini-WBC (World Boardgaming Championships), with the main activity being lots of tournaments with multiple heats and a final played Saturday or early Sunday. Many people don't stay around for Sunday, or leave quite early in the day. There are vendors selling games, both independents and publishers, but that's not the focus of the event, though my focus was talking with some of these people, of course. I don't play in tournaments at conventions--I can play published games without traveling 250 miles and spending lots of money. I like to talk with people (publishers and players) about games, and I watch some of the Britannia tournament, as well as watching people play many other games. Sometimes I'll read rules to a game that looks interesting. Sometimes I'll play one of my games solo and talk with people as they come by. I did get Eurasia played twice. It is hard, at a small tournament-oriented convention, to get people together to playtest. Several people offered to play Barbaria, but I couldn't get all together at the same time. My roommate stayed up past 5 one night playing Robo-Rally (his favorite by far, and he won the tournament for a second time on Sunday). I was in bed before 1 every night. On the way home we experienced heavy snow and were down to 20 miles an hour in one lane on a wide US route (two lanes each way). But we got over some kind of hump, and the weather rapidly cleared to occasional rain, with no snow in sight, just as we got into Danville. Thank heaven. If you like playing tournament games, PrezCon is excellent, and perhaps slightly less "cut-throat" than WBC in Lancaster, PA in August.